2009; Pew Internet and American Life Project, September 2009 PARTICIPATORY MEDICINE These new interactive capabilities are having a profound impact on healthcare. Pew notes that 8 in 10 Internet users — or 61% of U.S. adults— have looked online for health information. More patients are more knowledgeable than ever before, and they’re staying online to discuss and share what they’ve learned. Online communities focused on healthcare are serving to quickly exchange information, questions and answers between healthcare providers, patients, families and friends. Subjects range from simple procedures and advice on parenting to full-on emotional support when facing a chronic illness or the loss of a loved one. This online democratization of healthcare information is a key component of what’s being called “participatory medicine” — a model of medical care that emphasizes an active role for the patient. When you or your loved ones fall ill, knowledge is especially empowering and comforting — as is the understanding that you are part of a larger community. SOCIAL MEDIA AND YOUR HEALTH Of course, the vast majority of people with a health problem want to consult a healthcare professional in person, and the prevalence of online information makes some people worry about a world that seems more isolated, not less. But recent studies have shown that active users of new communication technologies are actually deepening their social circles, not shrinking them. In addition, the very act of participating in social media may have some health benefits of its own. “Our survey results suggest that people’s lives are likely to be enhanced by participation with new communication technologies, rather than by fearing that their use of new technology will send them into a spiral of isolation.” CONNECTING FAMILIES Social media first took root in college towns and other clusters of high-tech young people, but its explosive growth since has hardly been limited to teens and tweens. Once families find out how easy it is to stay in closer contact with a few short messages (like on Facebook), some shared photos (maybe with Flickr), or even by making a video call (as you can with Skype), it’s easy to get hooked! ALL IN THE FAMILY Two of the fastest-growing age groups on Facebook are 35-54 year olds in general, and women age 55 and older. The largest percentage increase in Internet use since 2005 has been in the 70-to-75 age group. Even though the conversations can be brief, and sometimes may even seem a little mundane, there is something powerful about regular contact. 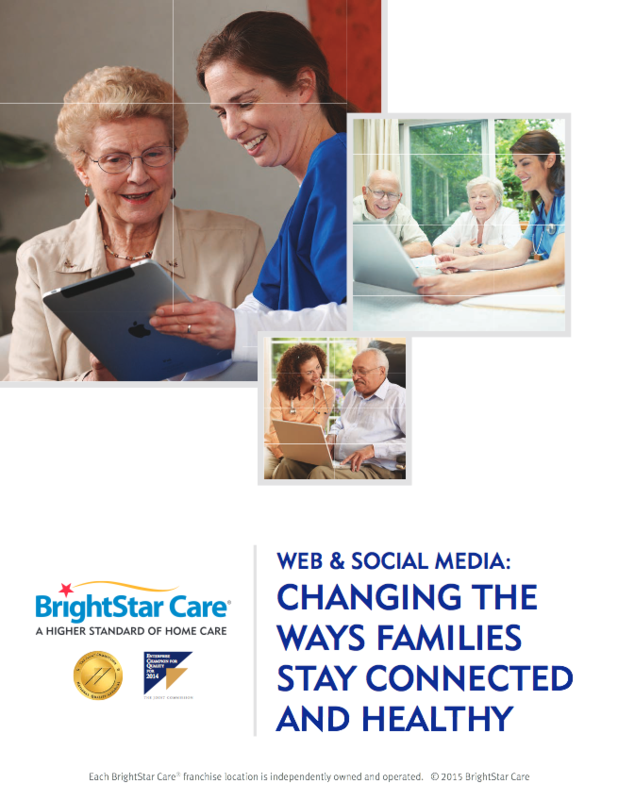 Life is lived in the details, and sometimes the “little things” are more meaningful and poignant than we might expect, as a member of our BrightStar Care family discovered firsthand: “Around October of last year, my aunt joined Facebook. She had recently found out that her breast cancer had returned and had spread to her bones. She lived all the way in Arizona, and the distance usually made it difficult to keep in touch and even more so to visit. But on Facebook, we kept in touch, sending the occasional message and sharing photos — none of which would have been possible without it. Even though we couldn’t be together, when she passed away in May, I was so thankful that we were able to connect — so grateful for something so seemingly tiny as a few messages. It meant a lot. And I still drop by her Facebook profile from time to time to look at her photos and leave a message. I suspect that I’m not the only one who has had this kind of experience with Facebook. It literally changed my relationship with my aunt.” – Erin S., Chicago HEALTHY INTERACTION With social media, staying home for health reasons doesn’t necessarily mean you’re confined to those four walls. The interactive and social nature of the online world has opened up countless opportunities to connect and stay connected, regardless of your age or ability. It can be a great way to share your thoughts and feelings, solicit feedback from an engaged audience, make new friends around shared interests, and keep in touch with loved ones who may live far away. It can stimulate brain activity, boost your mood and relieve stress, all of which can make a significant impact on people with dementia, Alzheimer’s, depression and other conditions. It sounds good for you, and some research is starting to back that up. A recent university study indicated that spending time on the Internet can help slow the effects of dementia by boosting the brain activity of the elderly. Using brain scans, a team at the University of California, Los Angeles (UCLA) found that using the Internet stimulated the mind more strongly than reading, with effects that continued long after an Internet session had ended. For seniors who did not usually surf the Web, the use of the Internet was found to change brain activity patterns and enhance function. Socializing is important at any age. In fact, some other studies point to a direct correlation between strong social ties and lifespan. Blogging and social media tools like Facebook are helping seniors to connect with others and express themselves from the comfort of their own home. Family caregivers use CareTogether features like the disease-specific resources, calendar, task lists, and journals to care for a loved one.